Advertise on Cider with Rosie in October! 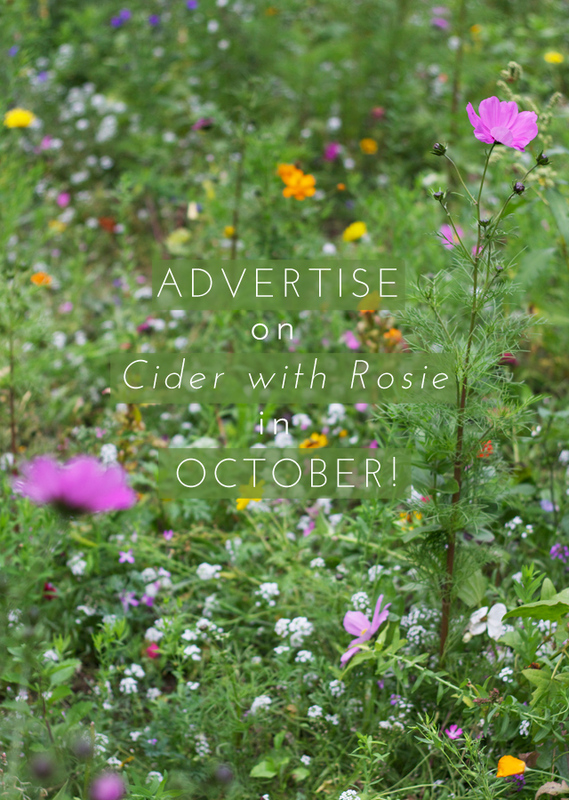 October is the perfect time to advertise your blog or business on Cider with Rosie! In the past month Cider with Rosie has been visited by more than 5400 people, and its following has grown by over 20%. Having been featured and promoted right here, current and previous sponsors’ blogs have shot straight to the top of Bloglovin’s Up and Coming list, and have noted significant follower growth. To read testimonials from past sponsors, click *here* and *here*. My readers truly are the sweetest, and are always keen to find exciting new blogs to read. If you’d like to see your own blog featured here and to be introduced to Cider with Rosie’s wonderful readers, head over to the ‘Sponsor‘ page to take up an advert! There are a range of advertising packages available, all of which include a linked advert in the sidebar of my blog and other promotional features that help my readers to learn about you and your blog or business. I would urge all bloggers out there to advertise with Rosie. My ad package has resulted in lots of traffic and some lovely new followers aged equally lovely comments. It’s also a pleasure to get little tweets and comments from the lovely lady herself as well as her kind words at the end of the month.